Pierre: “I hope Mom realizes that I could dig up a chest of gold someday. She needs to give me free rein to make giant holes in our yard! Bentley: “The devastation caused by Hurricane Harvey is incredible but so are the heroic efforts of people and businesses across the country. We are proud to announce that two of our favorite affiliate companies are making a difference and you can join their efforts. The founders of PrideBites are native Houstonians and have joined Lance McCullers Jr Foundation to help support families and animals. They are donating 100% of the proceeds from their awesome hoUSton collection to Houston animal shelters. Theses donations will assist the shelters in transporting animals to safety so they won’t be euthanized due to displacement from the storm. You can order here. I love them for helping! You can always save 20% on your PrideBites orders with our PAWtner code MKCLINTON. Dr.Harvey’s is donating their wonderful bird foods to the Gulf Coast Exotic Bird Sanctuary in Texas. They were forced to vacate their sanctuary and set up in a storage facility. Dr. Harvey is sending both their large and small bird food to help. If you would like to contribute to them, visit http://www.gulfcoastexoticbirdsanctuary.com/ and if you are looking for high quality for your feathered friends, check out Dr. Harvey’s bird page. As always, you can save 10% with our code BFTB118. 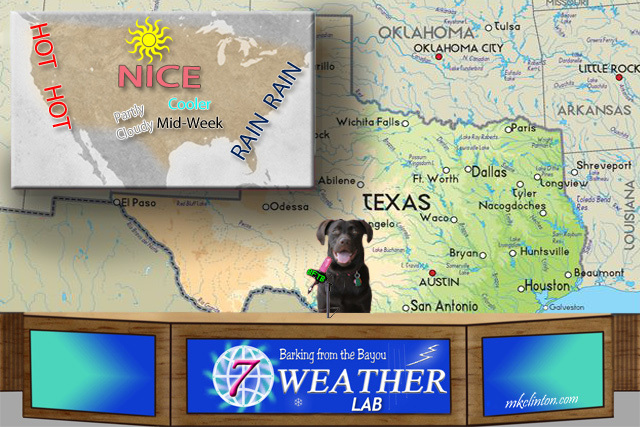 Paisley the Weather Lab: “It has been an unbelievable week here in the Houston area. People have opened their heart and their wallets to help. Thankfully, we have had some great weather and a lot of the water has receded. The recovery will be monumental but we remain Texas Strong! It is going to be a nice week for most of the U.S. with sunny skies. The west coast will continue to see soaring temperatures as the L.A. area battles wildfires. Our friends in the north will have sunshine and temps in the 80’s. If you are in the center of the country, expect nice weather. Here in the south, we will have partly cloudy skies with a cool front heading our way by midweek. Now for our readers on the east coast…it is still a bit early but you need to prepare for Hurricane Irma. We can’t be sure if it will make landfall along the coast but we have learned the hard way that you need to be ready to evacuate if necessary. You can expect a lot of rain during the week because of Irma. Always keep an eye to the sky and ear to your local weather for updates and warnings. Bentley: “Thanks for that forecast, Paisley. We hope that you enjoyed today’s report. 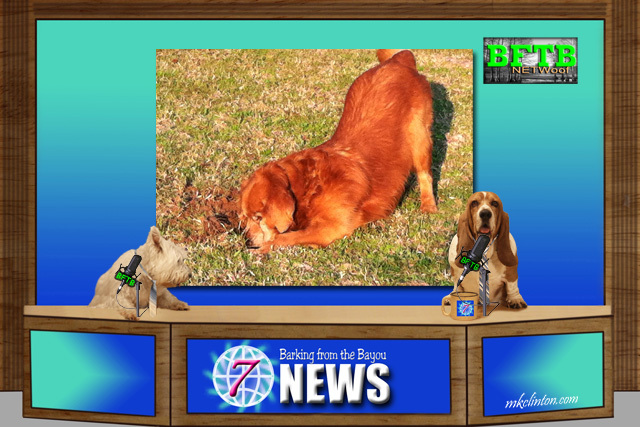 On behalf of the BFTB NETWoof News team, we appreciate you dropping by for our report. You won’t want to miss a day this week as we introduce some new treats and share more great pet parenting tips. College is the PRIME of your life! We hope that the sun comes out so you can play and dig for treasure in your yard!! Cheers to that possum on getting a brand new home! Nice strategy. While Texas is a horrible mess, let's not forget Montana is burning up and no one mentions it because it isn't a heavily populated state. Nevertheless, over 6500 acres have gone up in flames along with many buildings and some homes. Scary stuff. The wildfires are horrible. Montana and California are facing massive fires. It is crazy how part of our country has too much water and other parts are parched and burning. They are in our prayers. We've heard about Hurricane Irma and we hope fizzles out NOW! We hope Irma decides to stay over the water. Great report! We hope there are no more Hurricanes !!!! We are so over this hurricane season! My goodness, I can't even begin to think what I'd do if I discovered a possum in the tissue! We continue to hope Mother Nature stops being so cranking with searing temperatures on one side of the country and even more rain for the other. I know that I would have needed that toilet paper if I'd opened the container and seen eyes looking back at me! BOL! This weather is crazy. How pawsome that they built the little possum their very own home. 3 bum swings! 3 more! 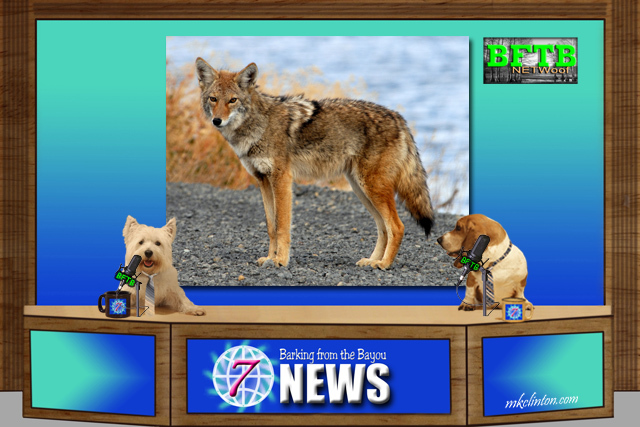 My heart goes out to these coyotes & other animals who suffer with sarcoptic mange; being itchy is horrible but come winter this is a very serious problem. Hopefully, those who have authority will assist in their healing. We have read that Ivermectin paste is an antiparasite effective for treating sarcoptic mange & is often put in food out in the wild to help clear it up. Years ago the foxes in our parts suffered with this mange & I understand this is how the Ministry of Wildlife handled it. Paws up for all those who are doing their part in helping those who have been effected by Hurricane Harvey! We are looking into sending our toys to those animals waiting for their families in shelters. That is a great idea to treat the mange. I can't imagine how miserable it must be for them. Disasters do bring out the best in people. We're happy people and animals are receiving help. It's going to be a long haul, though. Poor coyotes. We hope they get some relief....for their sake AND to keep other animals safe. It fills me with hope that we can actually come together as caring people to make a difference. I am so sad about all of the fires. It seems to be either too much water or not enough! I am glad so many are helping the animals in Texas. It is a wonderful thing to see so many rescues and companies saving the animals. We also hope Irma goes North and missed the US!! 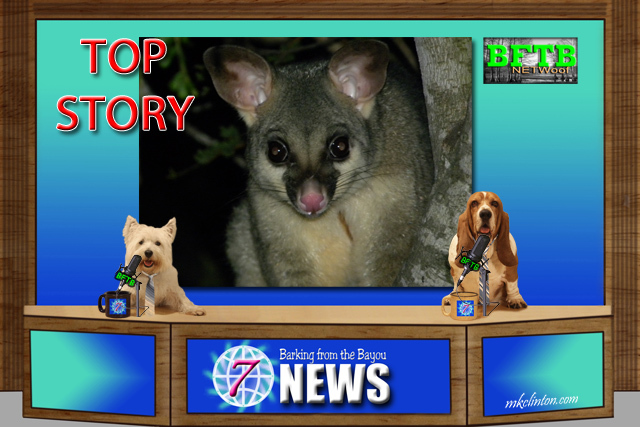 Thanks for another pawsome news report!! We are praying that Irma turns and misses our friends in Florida and the coast. I hopes Irma stays away from the US! They don't needs anymore destruction down south! Geesh. Ma says she will go check out all those pawsome sites...I'm STILL waiting on my PRIDEBITE toy she promised me last time! Maybe for my Burthday in a few weeks ☺. Yeah, I've had enough of this weather....HOT, HUMID, and SMOKEY! sigh. Anyhu, I hopes you guys have a FABulous Labor Day!!!! It is so nice of these companies to help out after the hurricane. Too bad the oil companies couldn't learn to not always put their profits ahead of everything else, and stop jacking up the gas prices just because. If Irma hits too, gosh only knows how high gas will go. :( People should be able to use their money to help out instead of having to pay more at the pump. Mommy read about the zombie coyotes this weekend. So sad for the coyotes and scary for the rest of us. Good job spreading the word, boys! Holy cow that's a lot of heroin! Good luck to all the peeps dealing with Irma.